Day 3 turned into the most eventful day. Waking up and packing the bike in the pounding rain was not the start I was hoping for. Ed likes to bush camp. I’m fine with that, but we spent 45 minutes driving around in the dark, with pouring rain looking for this gem of a camping spot. I had to set this up the night before in the rain and by the time it was setup I was exhausted, eaten my mosquitos and just fell asleep in all my gear. 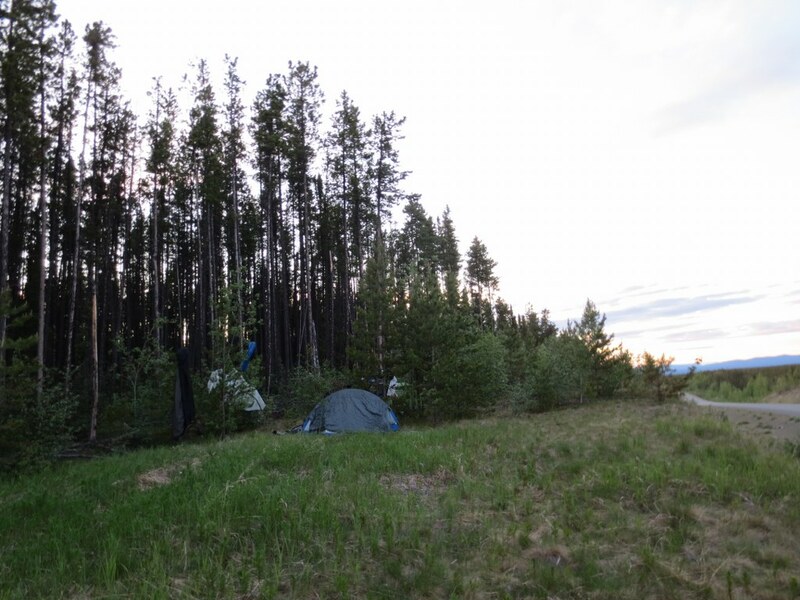 My tent was setup on a slight hill and I was laying on a number of sharp branches and sticks. This isn’t the Holiday Inn. After packing up my mood had changed, I wasnt going to let a little adventure get in the way of enjoying the trip. 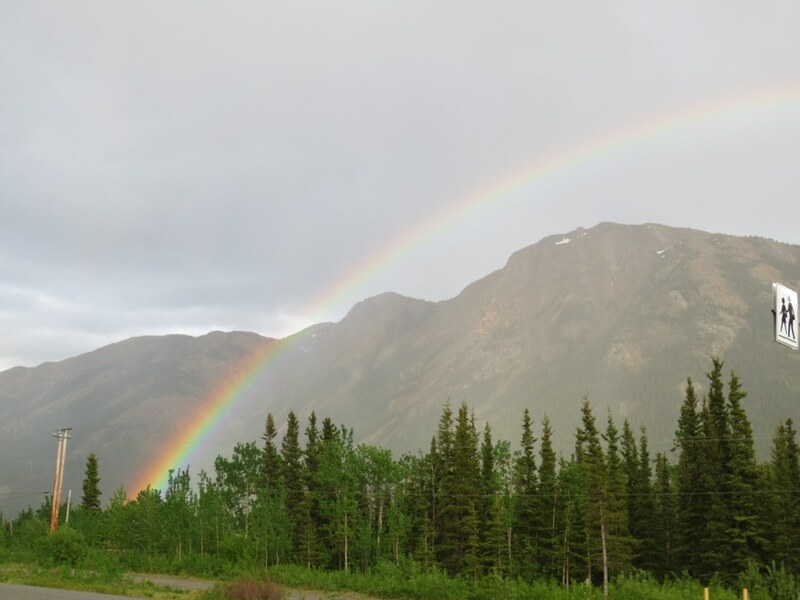 A rainbow came out and I was sure it was my sign that my bad luck had run out…right? 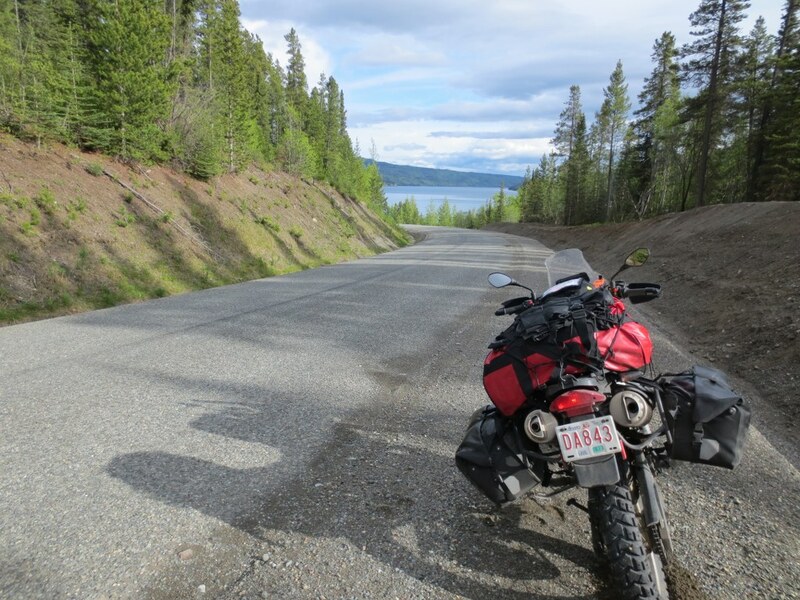 The day was long and wet, but as we got close to the Yukon border the sun came out and it was warm and sunny. 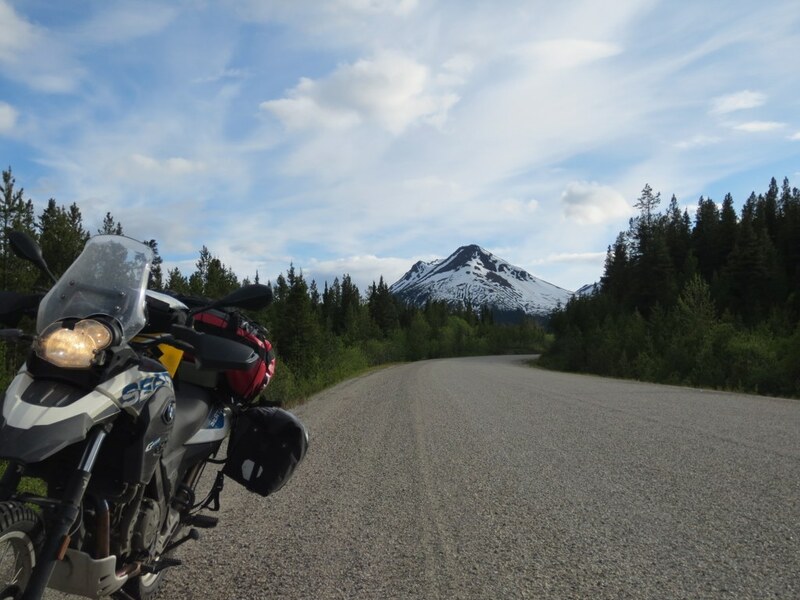 Riding in Northern BC is perfect, empty highways, well maintained, well marked, perfect scenery and changing geography. The stretch of highway right before the border had rows and rows of campers in the ditch. 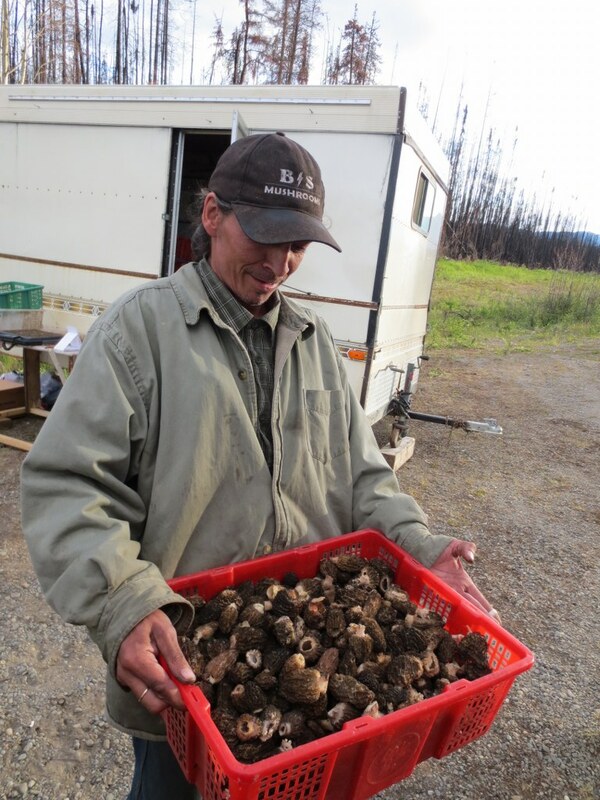 Its too early for hunting so we asked a guy, turns out everyone was mushroom pickers. At $500 per pound (dried) its very lucrative. I chatted up a guy who buys from pickers, he explained the process, pretty interesting. As it was getting late and there were so many campers, I asked him if its ok if we pitch our tents and camp here too. He says its no problem setup a tent anywhere. Since I didnt know the mushroom pickers protocol, we opted to ride down the road another km before setting up camp. With so many people trouncing through the woods we were more concerned about human encounters than wildlife. We setup camp on the west side of the road up on a bluff so cars wont stop and mess with our bikes. 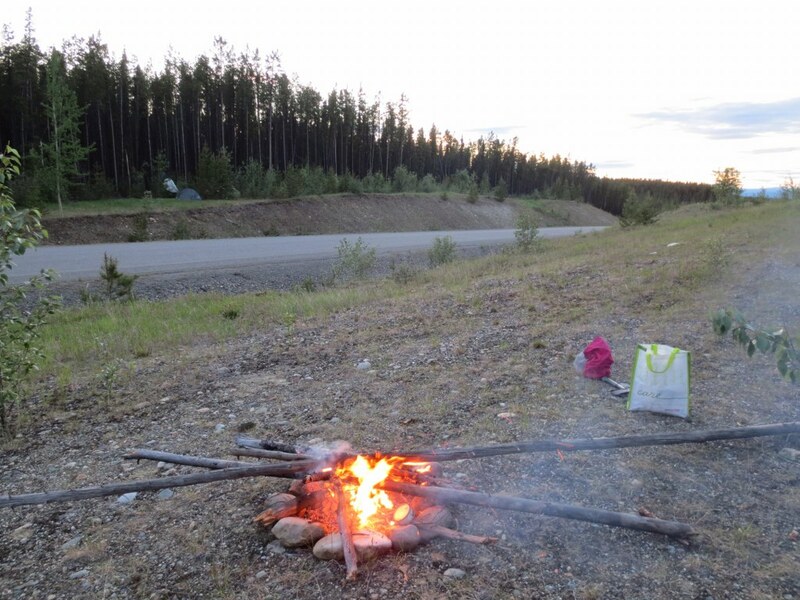 We take our food to the other side of the road where its gravel and easy to get a campfire going. We get a small fire going and begin to open up some food. I asked Ed if he thought opening up a can of Tuna was smart. I didnt have anything I could eat raw and I didnt want to spend the time to cook. He says he is going to open up a can of salmon so it should be fine. We are away from our campsite, relatively close to people, and have a fire going. We pop open our cans and start to eat. Suddenly I look past Ed and about 25 yards away see a large Black Bear walking directly towards us. My heart skipped a beat and I calmly tell Ed to not turn around, that there is a bear, and to drop his food and start walking away. He spins around and gives me the same look I must have been giving him. Ed is 6’10”, that’s almost seven feet tall, but the bear was not worried at all, it just calmly walked closer, stopped about 15 yards from us and stared. I kept staring at him and slowly walked backwards. I had my camera in my pocket, but was too busy trying to keep my pants from filling up with sheppards pie to even think about snapping a picture. In hindsight I regret not snapping a pic as he was so close. We briskly walk down to the road, then hustled up the embankment to our tents. The bear starts to come even closer, but is on the opposite side of the road. Ed frantically packs up his tent and gear and I grab the spray and air horn that I had on standby. I give the bear four loud airhorn blasts and he doesnt blink. The Fox40 Ecoblast didnt even phase the bear. This is when the ‘oh s**t’ moment hit me. 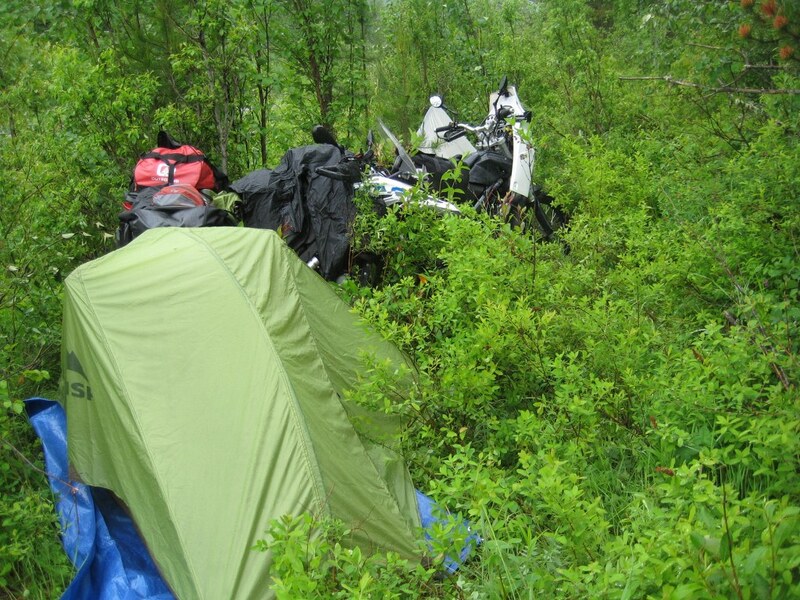 My bike is buried behind a bush and my tent and gear is setup. I decide its better to get my bike out in case I need to make a quick exit. 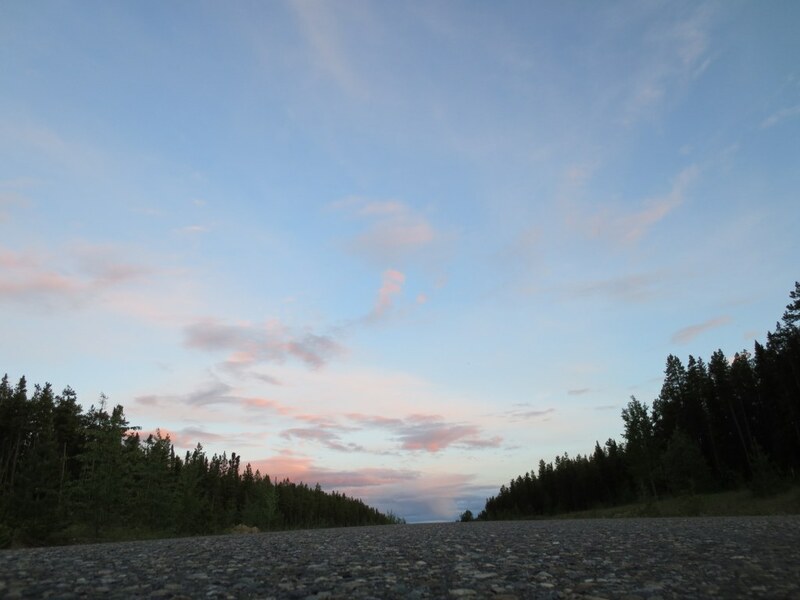 The only escape without going closer is down the embankment, I hold on and pound down the gravel hill towards the road, once on the road I honk the horn and bear doesnt flinch. I now have to decide whether I even get my gear. I have never packed up camp that fast in my life. Im running up the hill grabbing as much as I can, running down the hill, jamming it anywhere on my bike it will stay (and not melt), running back up the hill. I decided to put on my moto gear and helmet just in case, and even with all that gear I could run up a 20 foot hill in seconds. One person would watch the bear while the other packed, but he kept coming closer and sniffing around where our food was. I figured he just wanted our food, but didnt want him to think we were a threat. I was angry with the prospect of some bear getting his grubby paws on all the snacks that Ash packed, I knew how angry Ash would be if I told her a bear ate my snacks. 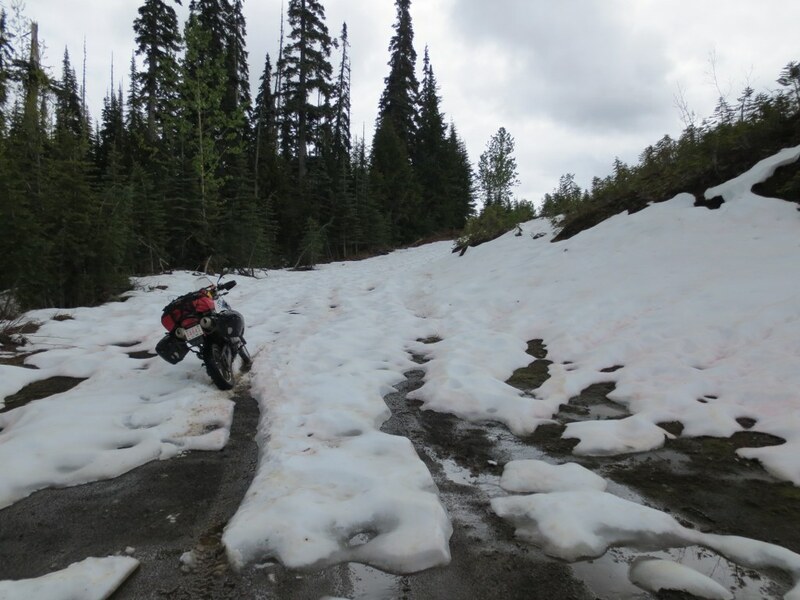 Both Ed and I were rattled, had our bikes on the side of an empty road jamming stuff whereever it would fit, both bikes running, ready to jump on if the bear charged. A truck came down the road and we frantically flag it down. I was a family and I think they were a bit freaked out to see two guys (one seven feet tall) with their helmets on waving their hands to stop. We got them to block the bear and our bikes so we could finish packing. As soon as we had our stuff loaded we took off. I must have looked like a gypsy driving down the road with open bags and gear jammed in everywhere. 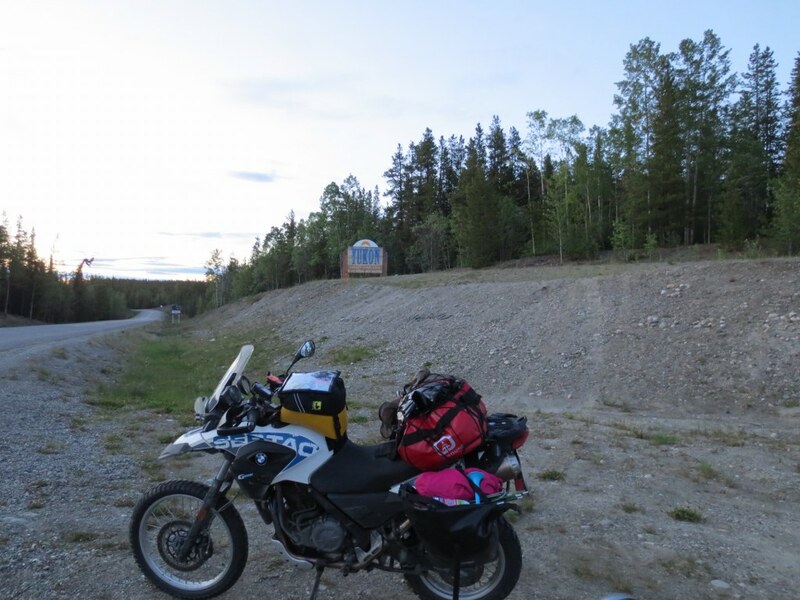 We got about 2km down the road where we stopped at the Yukon boarder to pack our stuff. That was the last time I was going to bush camp, we decided to make the drive the Watson Lake. It was 1am and still light out, so it was an easy decision. 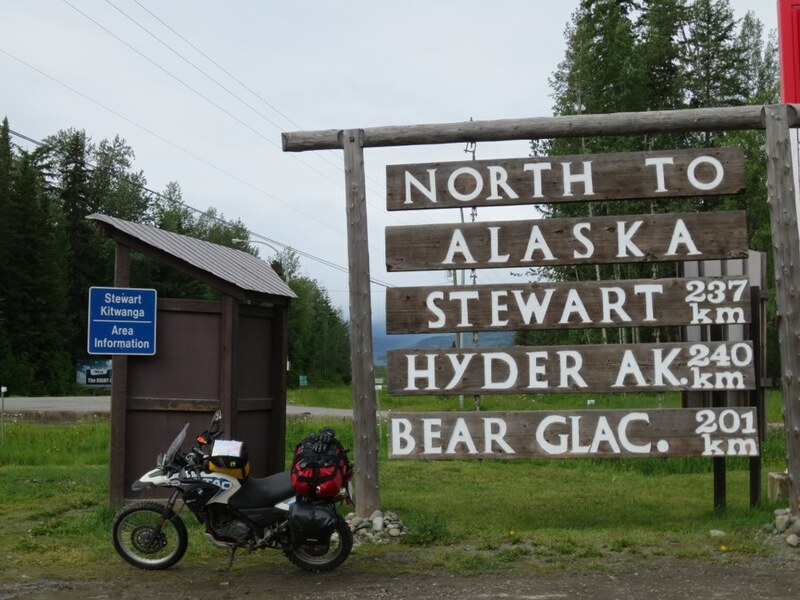 I ended up getting the Yukon border picture a day earlier. This explains to those following our Spot tracking why we had 2 camp places. We drove into Watson lake and I chose the site with the most people around. It was late, but I had never thought I would find solice up North when surrounded by people. If I ever write a Guide to Northern travel, rule #1 is going to be “Don’t Camp outside of Campgrounds”. Rule #2 will be “Dont eat canned fish in Bear country, stupid”. Wow!! What a crazy story!! On Day One, I remember Edward saying how it’s been 20 years since he’d seen a bear. Who knew what was ahead for you guys!! Glad you are both alright!! Take care. Love the blog.